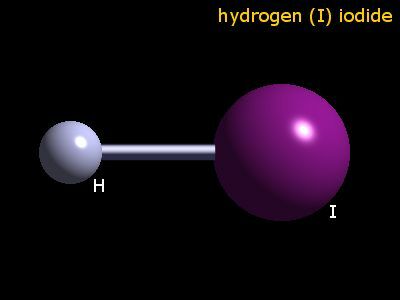 The oxidation number of hydrogen in hydrogen iodide is 1. Hydrogen iodide may be made in the laboratory by the reaction between purified hydrogen gas and iodine. This is catalyzed by platinized asbestos. Less desirable in the laboratory, but a process used commercially, is the reaction between hydrogen sulphide, H2S (danger!) and iodine. The table shows element percentages for HI (hydrogen iodide). The chart below shows the calculated isotope pattern for the formula HI with the most intense ion set to 100%.